Stock firmware file of A320YDXS2BRC5 for Galaxy A3 2017 is now available to download. Here is a very simple Step By Step guide to to install A320YDXS2BRC5 Stock Fimrware file on the Galaxy A3 2017 (SM-A320Y). The A320YDXS2BRC5 stock firmware file has to be downloaded using SamFirm software or SamMobile website as provided in the below section and then follow the manual update guide using the ODIN software to update the Galaxy A3 2017. Before downloading the Samsung Stock Fimrware File and update the same manually, you should check if the firmware OTA is already available for Galaxy A3 2017 or not. – Manually updating the firmware will DELETE EVERYTHING on the Galaxy A3 2017. – Make sure you do a backup of your phone or backup using Samsung Smart Switch or if you have TWRP installed then you can take a NANDROID backup using the TWRP. – I am not at all responsible if anything happens to your phone as a consequence of following this guide but I can assure you that I will help you as far as possible to get you out of the problem (if something happens). – Download Samsung Stock Firmware Using SamFirm. Download and install the Samsung ODIN application on your Windows PC before you proceed further. Take backup of your Android phone or using Samsung Smart Switch or if you have TWRP installed then you can take a NANDROID backup using the TWRP. – Or you can download the OTA updates from Sam Mobile links I have linked above. – Here is How to install Samsung stock firmware. 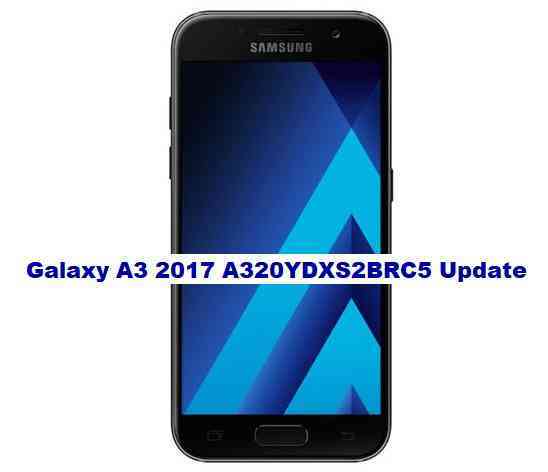 If you have successfully flashed the stock firmware file, then your phone would now be booting into the Latest A320YDXS2BRC5 Galaxy A3 2017 firmware update. If you have any concerns while following this update then just login to comment. Till the next update just stay tuned. Stay tuned or Subscribe to the Galaxy A3 2017 forum for recovery, rooting, custom ROM guides etc. and all other device specific topics.